Artweaver Free is a freeware painting program which is suitable for beginners but also suitable for advanced users. You can record all your steps and replay them afterwards or provide them to other users. Also there are many tools and features like layers and effect filter in Artweaver Free. You can record the whole painting process, save it and replay it later with Artweaver Free. So it is possible to show other users your painting style or you can just show the progress from an empty paper to a finished artwork. Artweaver Free includes a big number of predefined brushes. But you can also configure each brush individually or create new custom brushes. Beside simple round brushes it’s also possible to use custom images as brushes. 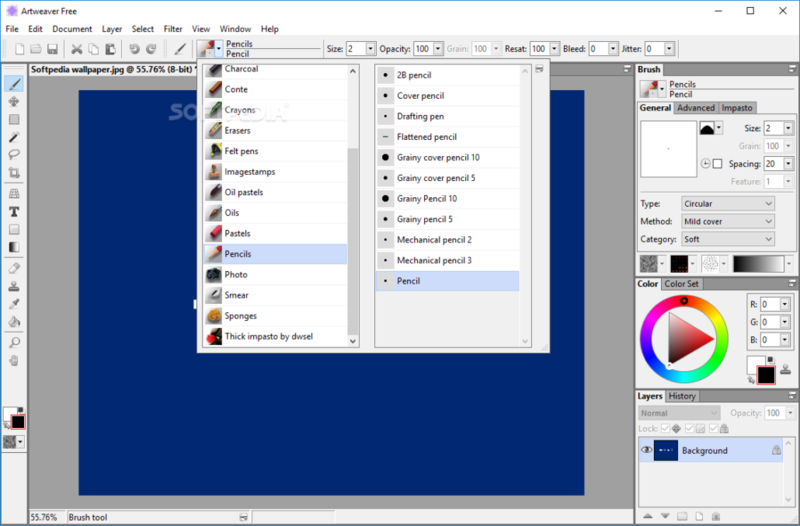 Artweaver Free has an intuitive and easy to use program window. But you can also adjust it to your own needs. For example free arrangement and docking of palettes. You can work together with several artists over Network or Internet on the same document with Artweaver Plus. Besides watching at brush strokes other artists or adding own brush strokes, you can also chat among each other with messages. Create an own team at ArtweaverTeam.com which is worldwide reachable.